My Domestic Monastery: Book Release Day!!! It's Here!!! Book Release Day!!! It's Here!!! I'm eeking this out before midnight in my timezone, and the reason for that is another story for another day. BUT...the book is here!! I am so excited to share this beautiful little book with you. As I said in my last post, we've found some good resources for praying the Stations of the Cross with slightly older kids...but what about the one year old? The two year old? The three year old? (And some days...even the five or six year old???) How can we bring the Stations into their awareness in a gentle, yet theologically solid way? I Walk With Jesus - A Simple Way of the Cross is modeled after the style of book that my young children love best. Each station has a picture, a word to focus on, and a brief sentence to summarize the station. The beginning and end of the book feature short, classic prayers associated with the Stations of the Cross and Paschal mystery, and you could easily incorporate the announcement of the name of the Station and the "We adore you O Christ, and we praise you..." prayer into each Station if attention spans allowed. But you'll also notice something else - this book isn't just for toddlers and babies. It could very easily be used with older kids, including (but not only) older kids with special needs. It's simple, but it's not babyish. 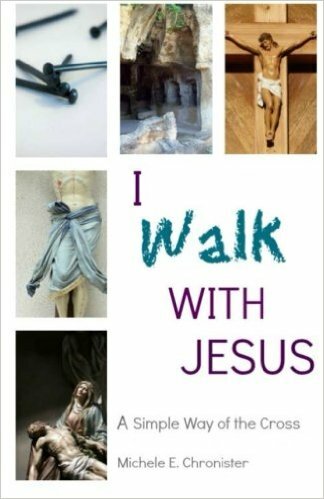 I'm releasing this book at the start of Lent, the most popular time to pray the Way of the Cross. But honestly...this classic prayer of the Church is one we would benefit from praying throughout the year. Throughout Lent, I'll be sharing this book (and opportunities to win a copy of your own!!!) on some of my favorite blogs. If you can't wait...you can buy your copy today!! The book is available on Kindle Fire, Kindle Android, paperback, and PDF. I can't get it to work on my KindlePaperwhite right now, so I'm going to troubleshoot that (just to give you a heads up). BUT it has been formatted for Kindle, and if you want to read it on your Kindle Fire or Android device it looks absolutely beautiful! (And really, those are my preferred means for reading kid's e-books anyway, so that you get to see any color. Most of these pictures are black and white, but there are color coded words throughout the book). And, well...why don't we go ahead and give away a copy right here??? Winner will receive a Kindle or PDF copy of the e-book. Giveaway closes on Sunday! Yay! We have something for the rosary, not for the stations. Exciting. So great! We have several books for stations and have made some simplified ones too, but so glad you are sharing this with others! Awesome! Perfect for my ages! What a wonderful idea! I like how you describe it as simple, but not babyish- leaving it open to use for many ages and stages. Thanks for the chance to win! This sounds wonderful! I've been struggling to find ways to help include our 3 year old in our Lenten observances, and this sounds like something he would love. This sounds perfect for my 1 and 3 year old! Sounds great for my 4 year old and 17 month old.